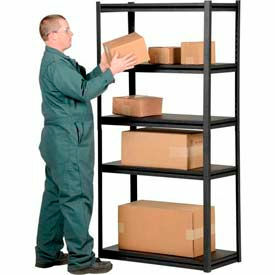 Economical System allows you to rearrange shelves and add components without dismantling the entire unit. 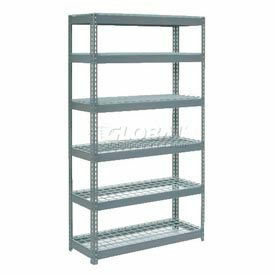 20 Gauge Steel Shelves feature welded tubular box support on all side. 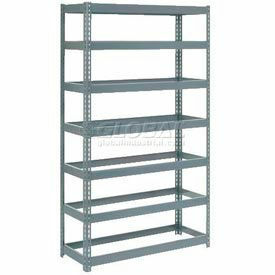 Shelf capacities up to 800 lbs. Shelves attach to 16-gauge steel posts via clips. Ships unassembled. Made in Canada. 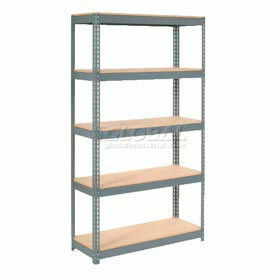 Metalware Wide-Span Boltless Shelving is easily installed, cost effective, and available in multiple depths, widths and heights as well as offering multiple surfaces for the shelves such as wood, wire mesh and steel. Ideal for record storage, Wide span’s dimensions are in line with standard archival box sizes. One-piece welded frame features roll-formed steel posts and seamlessly welded tube bracing for extra strength and rigidity. Tear-drop keyhole beam connection. Shelf levels adjust in 1-1/2" increments. 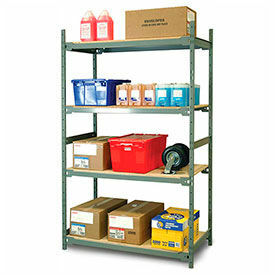 Starters can be used individually or combined with add-ons to complete a row of shelving. Units are constructed of 14-gauge welded steel with up to 2200 lbs. 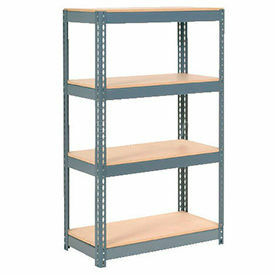 shelf capacities (based on evenly distributed loads). One-piece welded frame features roll-formed steel posts and seamlessly welded tube bracing for extra strength and rigidity. Tear-drop keyhole beam connection. Shelf levels adjust in 1-1/2" increments. 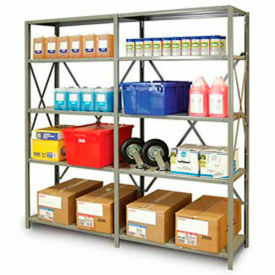 Starters can be used individually or combined with add-ons to complete a row of shelving. 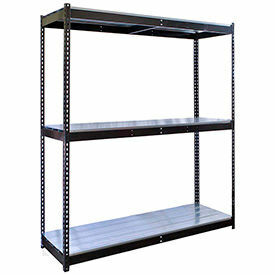 JBX System 100 Premimum Bolted Steel shelving complete units are bolted to 1-1/2" x 1-1/2" posts. Provides easy access to stored items from all sides. Super-strong roll formed steel framing with positive interlocking beam and post connection. 2-1/4" x 1-1/2" x 14 gauge uprights. 5/8" thick particleboard decking. Beams adjust vertically on 1-1/2" increments. Choose the size that match your needs. Fast, easy assembly in less than half the time of conventional shelving. No tools, nuts, bolts, clips or cutting required. Durable gray baked enamel finish. Provides easy access to stored items from all sides. Super-strong roll formed steel framing with positive interlocking beam and post connection. 2-1/4" x 1-1/2" x 14 gauge uprights. 5/8" thick particleboard decking. Heavy Duty Models have single rivet cross and front to back beams on intermediate levels. Extra Heavy Duty Models have double rivet beams on all levels. Beams adjust vertically on 1-1/2" increments. Choose the size and load capacities that match your needs. Easily reconfigure unit as your requirements change. Fast, easy assembly in less than half the time of conventional shelving. No tools, nuts, bolts, clips or cutting required. Durable gray baked enamel finish. 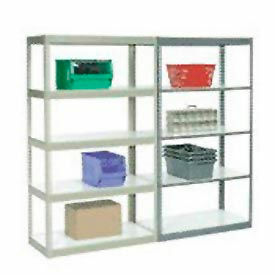 Rugged, reliable steel shelving features 1/2" thick white melamine and particleboard shelf decking for a strong, smooth and easy-maintenance surface. Provides easy access to stored items from all sides. Super-strong roll formed steel framing with positive interlocking beam and post connection. 2-1/4" x 1-1/2" x 14 gauge uprights. Beams adjust vertically on 1-1/2" increments. Choose the size that match your needs. Fast, easy assembly in less than half the time of conventional shelving. No tools, nuts, bolts, clips or cutting required. Durable gray baked enamel finish. Choose The Boltless Shelf Thats Right For You! 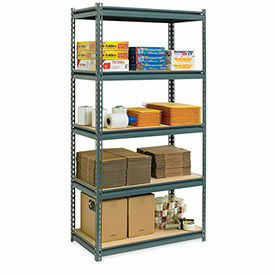 Add another shelf level to your boltless shelving unit with these additional levels! Beams are made with super-strong roll formed steel. These rivet beams with positive interlocking ends easily attach to our 2-1/4" x 1-1/2" x 14 gauge upright posts (sold separately). Allows easy height adjustments at 1-1/2" increments. 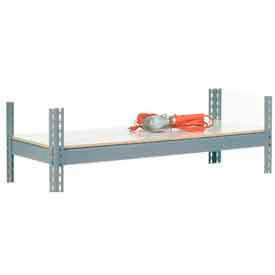 Use Extra Heavy Duty Shelf Levels that use double rivet beams to provide extra strength and greater capacities; must be used on top and bottom levels for stability. Choose between Wood Deck, Wire Deck, Laminated Deck or No Deck levels. 1/2" thick Laminated Deck has a stain resistant melamine surface that is easy-to-clean. 5/8 thick Wood Deck is made with particleboard wood that creates a sturdy platform for merchandise. Offers high density for rigid strength. 1/4" thick Wire Deck is made with 4 gauge welded steel wire and features 3 square inch openings. Gray epoxy finish. Wire decking allows visibility and light, air and sprinkler penetration (reducing insurance premiums). 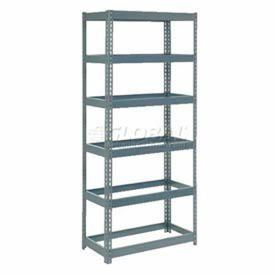 High Capacity Boltless Metal Shelving Is Used For Applications That Require The Heaviest Capacities. 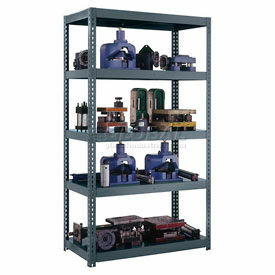 Extra strength boltless shelving units withstand dies, fixtures, jigs and other heavy material. Made using heavy duty steel with a tough powder coat finish. 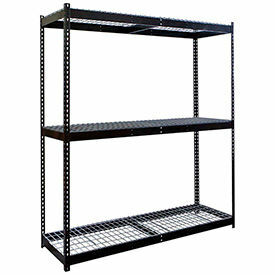 16 gauge steel shelves are reinforced with 14 gauge double rivet steel beams for maximum strength. Includes 5 height adjustable shelves that adjust at 1-1/2" increments. 14-gauge formed angle uprights provide strength and rigidity. 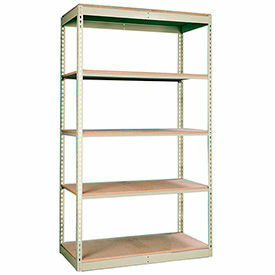 Boltless shelving is easy to assemble without the use of nuts, bolts or tools. By combining our adjustable Rivetwell shelving, heavy-duty, all-welded cabinets, workbenches and locker/drawer units, the Fort Knox Modular Utility Storage and Workbench System is a uniquely functional and durable modular system that provides numerous components allowing customization to create your perfect workspace. Fabricated from heavy gauge steel and coated with a unique textured two-tone black and red powder coat finish, the Fort Knox system will stand up to the most demanding users. Intelligent design allows each major component to be utilized stand alone or in conjunction with any of the other major components. 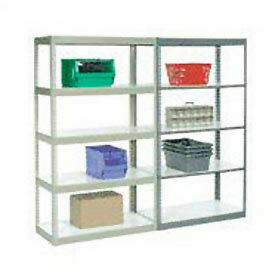 Hirsh Industries® Boltless Steel Shelving Units Are Used For Home, Commercial Or Industrial Storage Applications. 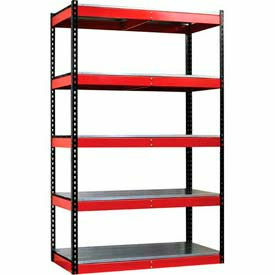 Hirsh Industries® Boltless Steel Shelving Units are solidly constructed for long lasting durability and dependability. 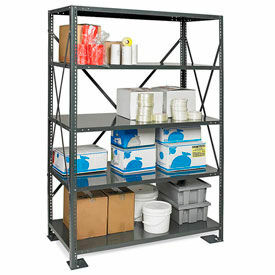 Free standing units hold up to 3,800 lbs of evenly distributed weight. Easliy assembles with only a rubber mallet. May be configured vertically or horizontally to fit most any space. Rugged particle board shelves. Smooth, rust-resistant Black or Light Gray finish. 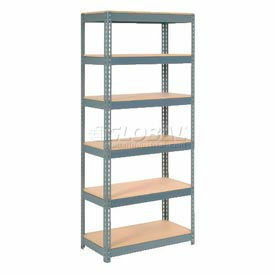 Available in 4 or 5 shelve units in various dimensions. Made from 33% post-consumer materials. Most models offer a limited lifetime warranty. Choose from a variety of brands of complete units and components including upright beams & decking. 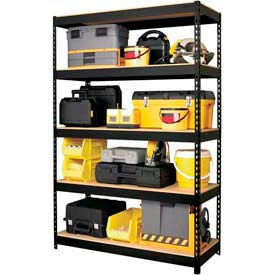 Rivetwell Boltless Shelving Without Decking Maximize Storage Space and Minimize Installation Set-up Time. Rivetwell Boltless Shelving without decking have components that attach snugly to one another without the need for loose fasteners. Factory attached rivets are left-to-right and front-to-back beams that align with keyhole slots in the vertical posts. Tap into place using a rubber mallet, for tightly assembled shelving that provides maximum strength and stability. Available in single and double rivet models. Use Hallowell Particle Board or EZ-Deck decking (double rivet only) - sold separately. Available shelf quantities are 3, 4, 5, 6, 7, and 8. Up to 2000 lb. shelf capacity. Dimensions vary. 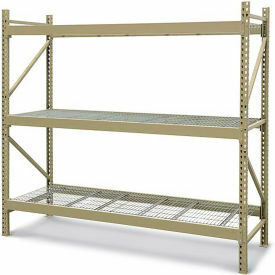 Rivetwell Boltless Shelving With Wire Decking Give you Sturdy and Durable Shelving to hold up to 1400 lbs. Rivetwell Boltless Shelving With Wire Decking have components that attach snugly to one another without the need for loose fasteners. Black powder coat finish with precision smooth surfaces provide sleek look. All units included center supported levels and are available without deck or your choice of four deck types. Factory attached rivets are all left-to-right and front-to-back beams and align with keyhole slots in the vertical posts for maximum strength and stability. Double rivet models available. Use Hallowell Particle Board or EZ-Deck decking (double rivet only) - sold separately. 3 shelf quantities. Up to 1400 lb. shelf capacity. Dimensions vary. 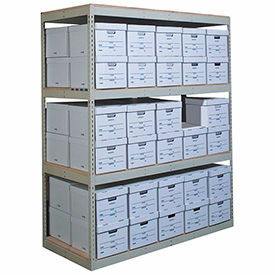 Rivetwell Record Storage Shelving Maximize Storage Space for Boxes of Records. Rivetwell Record Storage have components that attach snugly to one another without the need for loose fasteners. Factory attached rivets are all left-to-right and front-to-back beams and align with keyhole slots in the vertical posts. Once tapped into place using a rubber mallet, the units are tightly assembled for maximum strength and stability. Available in single and double rivet models. Use Hallowell Particle Board or EZ-Deck decking (double rivet only) - sold separately. Available shelf quantities are 3, 4, and 5. Up to 1150 lb. shelf capacity. Dimensions vary. 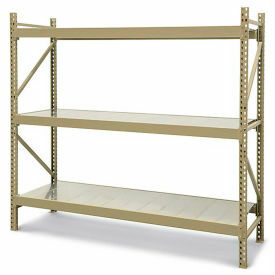 Rivetwell Boltless Shelving With EZ Decking Give you Sturdy and Durable Shelving to hold up to 1000 lbs. Rivetwell Boltless Shelving With EZ Decking have components that attach snugly to one another without the need for loose fasteners. Black powder coat finish with precision smooth surfaces provide sleek look. All units included center supported levels and are available without deck or your choice of four deck types. Factory attached rivets are all left-to-right and front-to-back beams and align with keyhole slots in the vertical posts. Once tapped into place using a rubber mallet, the units are tightly assembled for maximum strength and stability. Double rivet models available. Use Hallowell Particle Board or EZ-Deck decking (double rivet only) - sold separately. 3 shelf quantities. Up to 1100 lb. shelf capacity. Dimensions vary. 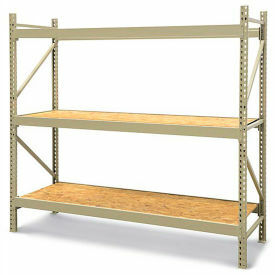 Rivetwell Boltless Shelving With Wood Decking Give you Sturdy and Durable Shelving to hold up to 1000 lbs. Rivetwell Boltless Shelving With Wood Decking have components that attach snugly to one another without the need for loose fasteners. Black powder coat finish with precision smooth surfaces provide sleek look. Center supported levels add to structural integrity and are available without deck or your choice of four deck types. Factory attached rivets are all left-to-right and front-to-back beams and align with keyhole slots in the vertical posts for maximum strength and stability. Double rivet models available. 3 shelf quantities. Up to 1100 lb. shelf capacity. Dimensions vary.